The MG M Type Midget was undoubtedly the first of a long line of MGs that were to make the sports car so popular throughout the world and it is almost impossible to overestimate the importance of the little car in this respect. The introduction of the Morris Minor in 1928 by William Morris obviously got Cecil Kimber thinking, especially as another rival; Herbert Austin had his Austin Seven well established in the market place. The Seven was introduced in 1923 and was doing well in racing events. The Morris Minor appeared five years after and was seen to be a worthy competitor with an overhead camshaft engine based on a design originally introduced on Wolseleys, whereas the Austin simply had a sidevalve engine. Cecil Kimber soon grasped the idea of producing an MG sports car based on the Morris Minor, since a lot of forerunners were Morris derivatives; this was hardly a surprising move. The M Type Midget was launched at the Motor Show at Olympia in October 1928, it was evident that the car would be a success with the tremendous initial demands at the Show and indeed it sold well for the ensuing three years. The car did not go into full production until 1929, utilising mainly Morris components with slight modifications. The narrow two seater body and its exterior fittings were the main differences. The reason for the similarity was the pressure to get the car on show at Olympia and there was not sufficient time to allow more individual components to be designed and manufactured. The body was a very simple affair being very light and of fabric construction on a wooden frame. The distinctive boat tail design was fabricated separately by Carbodies of Coventry and mated with the chassis at the MG factory in Abingdon. The engine was a four cylinder unit with a two bearing crankshaft and had an overhead camshaft driven through two sets of bevel gears and a vertical shaft. This shaft passed through the vertically mounted dynamo and doubled as the armature, with a flexible coupling transferring the drive from the armature to the cylinder head via a short shaft. The sturdy little 20 horsepower engine proved to be very reliable and the same basic design of engine was incorporated in the subsequent Magna and Magnette range of the era and was contributory to the success of these cars. The axles, chassis and clutch were all 'borrowed' from Morris, although the springs had decreased camber and the steering was modified with the steering column being more steeply raked. The remote gear change was angled downwards to give a lower driving position than on the Morris. The whole car then took on a more sporty appearance over its competitors, coupled with the fact that it had good roadholding and better performance and it retailed at only £185, the car not surprisingly sold like hot cakes! Much of the enthusiasm for the car was due to the sudden growth of Motor Sport and increased participation from owners of such cars as the M type. Weighing just 10 cwt and with 20 bhp available the car simply flew, 60 mph being achieved very quickly. 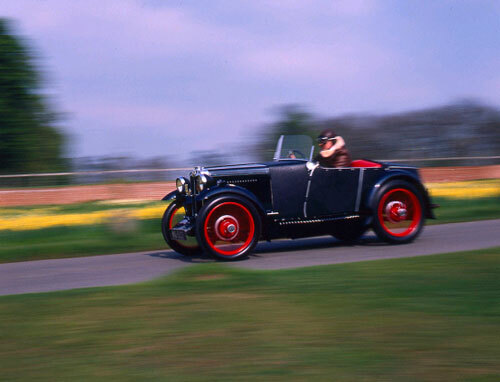 Motoring magazines of the time were full of praise for this MG and sports car history was in the making. Autocar are quoted as saying, "Sixty or Sixty Five miles an hour are not adventure but delight, acceleration is very brisk, altogether an extraordinary fascinating little vehicle." Because racing was now indulged in by private individuals successfully, this inspired Cecil Kimber to channel efforts into competition, for he was soon to realise the full benefits and sales potential of winning competitions with cars bearing the MG badge. A small racing department was formed at Abingdon and their attention and was focussed on developing the M type Midget. In 1930 an extra 7 bhp was extracted from the 847 cc engine and a works team of 5 cars was entered for the Brook-lands Double Twelve Race. These cars had special Brooklands exhaust systems, larger fuel tanks and slightly revised bodies with lower cutaway doors. Although some of their rivals had a distinct power advantage, the five Midgets endured the long hours at high speed admirably, to be rewarded with the Team Prize at the end. As a direct result of this prestigious win, a replica Double Twelve M Type was produced and added to the Midget range at £245 which now also included the Midget Sportsman's Coupe. This particular variant made a great impact upon its introduction and a notable customer was Henry Fords son, Edsel who imported one into the USA which created much interest amongst his fashionable acquaintances. It was in late 1930 that Cecil Kimber was to adopt the slogan of 'Safety Fast' and these alone inspired intending customers to purchase. Many improvements were made during the production span of the car and after appearing at the 1931 Motor Show for the fourth time, the M Type was eventually phased out in 1932. Over 3235 models had been produced, sadly it is anticipated that only about 150 to 200 survive to this day. Several special Midgets were produced based on the M type for record breaking attempts. During 1930 the factory produced a prototype designated EX 120, this chassis had a 6' 9" wheelbase as opposed to 6' 6" on the standard card with the main chassis members swept up over the front axle but passed below the rear axle. This project was destined for the Company's first attempt at international speed records. Well known record breakers of the era, Captain George Eyston and Earnest Eldridge were keen to secure the Class H speed record (for up to 750cc). The M type derived engine was modified from 847 cc to 750 cc, the chassis was fitted with a special pointed tail body and with various other modifications was ready for a record attempt by late 1930, The first attempt failed at the Montlhery track in France, but rapid modifications which included the fitting of a supercharger ensured success. Eyston took the car to over 100 mph on several occasions in February 1931 much to the delight of Cecil Kimber and the Abingdon workforce. Following this success a special Montlhery Midget was produced for the racing orientated owner, this was designated the C Type, but became better known as the Montlhery Midget. Tyre size: 27" x 4"
Cost new in 1930: £185. Treasure rating (tax) £8 per annum.